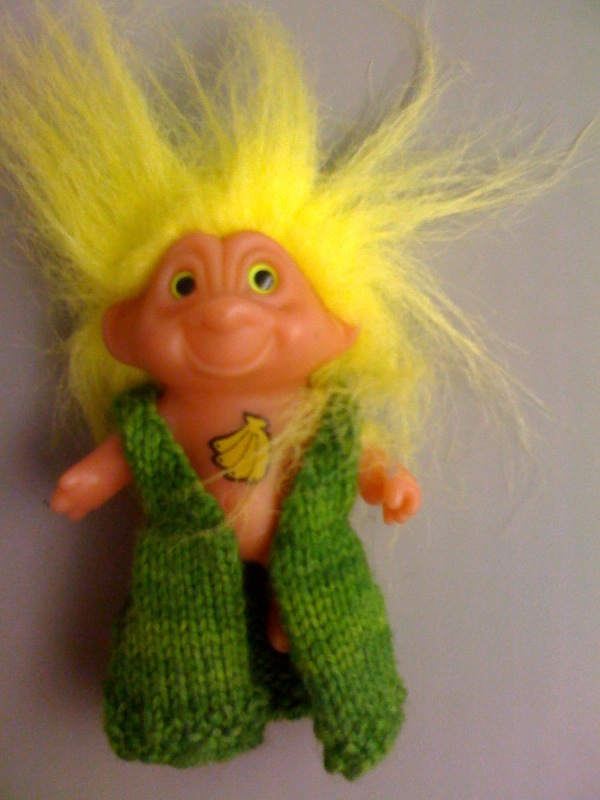 It’s what all the well dressed trolls are wearing this year.Â What?Â You don’t have a well dressed troll?Â Or even a badly dressed troll?Â Hmmm…Â Well, let me show you what the well dressed trolls are wearing in my office.Â Because really, you can’t have a necked troll hanging around the office, it’s just not done.Â Cue the runway music please. 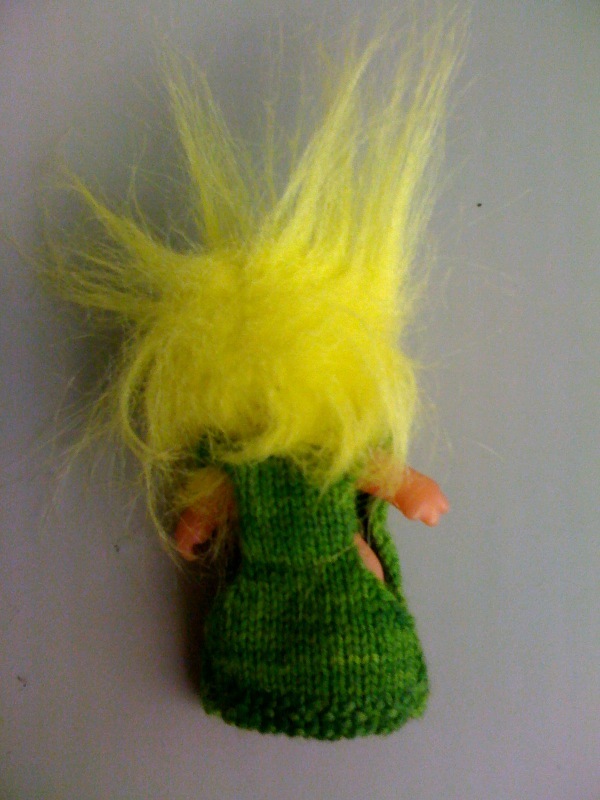 This stylin’ troll is sporting a green vest made from mystery stash sock yarn dyed with the pollen from one perfect flower in the deepest darkest regions of the forest.Â The vest is practically duster length to allow for full coverage of the entire troll body.Â The trim along the bottom of the vest is seed stitch. Each piece is painstakingly knit with teeny tiny needles and lots of fairy dust.Â The vest was made of 3 pieces which was seamed together to allow for greater stability in the full length garment.Â The vest retails for $99.Â Or the price of one lunch, depending upon the hungriness of the hand knitter.Â All that fairy dust and teeny tiny needles makes a person hungry. In all seriousness, one of my co-workers asked if I could knit him a vest for his troll.Â He writes a story about a troll every so often and includes clues about where the little troll is hidden.Â This story is sent out to his family so that they can find the missing troll.Â The winner not only keeps the troll, but all of the troll’s gold as well (rumored to be $100). The idea of knitting a troll vest out of leftover yarn just struck me as funny, so I whipped up a little vest.Â Not knowing exactly how big the troll was, I made the vest long with extra large arm holes. As for the yarn, I know I bought it at Shepard’s Harvest Festival 2 years ago and made a pair of socks out of it.Â I also finished a little baby hat and had just enough for a 2 inch vest.Â I would say I got my money’s worth out of this yarn.Â The pattern was one I made up as I went.Â I probably will not be publishing it as I don’t see much need for troll vests. Perfect way to start my morning and that vest beats a neked troll hands down!